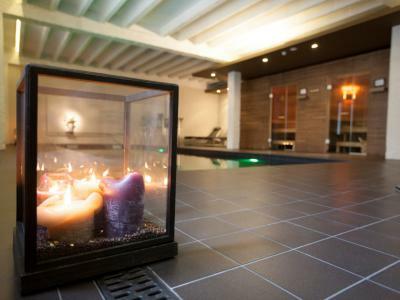 Vé Wellness is the luxurious wellness of Hotel Vé. Een oasis of rest .... in the citycentre of Mechelen. 2 sauna’s: 1 traditional sauna and 1 colortherapy sauna . The last one disposes of a Liftlight lighttherapy function which stimulates formation of Collagen and reinforces the skin. Our wellness is available for our hotel guests every day from 7 am to 11 am. Entrance: 9 euro per person. From 1 pm, everybody can rent our wellness privately for 2 hours, not only hotel guests .... Price from Mon-Thu € 105, from Fri-Sun € 105 per 2h/2 persons.